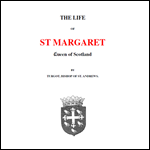 Margaret (Saint) (c.1046-1093). 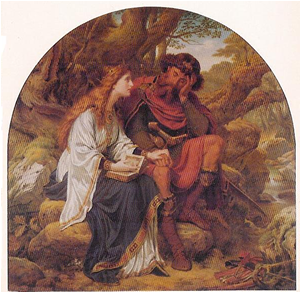 She was the daughter of Edward 'the Exile', son of King Edmund Ironside. Edward was an exile while the Danish Kings held the English throne. Margaret may have been born in Hungary. 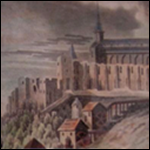 She with her family were under Edward the Confessor, her great-uncle, but exiled again after William the Conqueror excluded her brother Edgar the Atheling, from the throne. 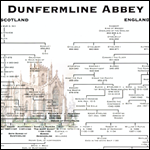 The family made their way to Scotland where she married Malcolm III in 1269-70. 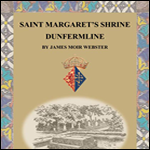 According to her biographer, Turgot, Prior of Durham, she eliminated out-date usages in the Scottish church, and, after correspondence with Lanfranc, Archbishop of Canterbury, brought Benedictine monks to Dunfermline. She patronised existing Culdee in the communities and made no changes in church organisation. 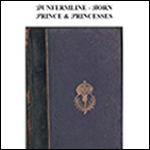 It is assumed that she was in general an important agent of southern influence. Buried at east end of Dunfermline Abbey, on the outside of present church, her Gospel Book is in the Bodleian Library Oxford. 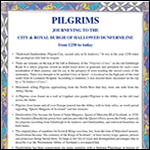 This picture can be seen in Dunfermline City Chambers.